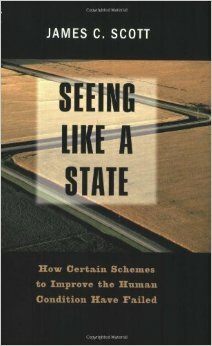 I recently had the pleasure of reading James Scott’s “Seeing Like a State,” which examines a certain strain of failure in large centrally-organized projects. These failures come down to the kinds of knowledge available to administrators and governments: aggregates and statistics, as opposed to the kinds of direct experience available to the people living ‘on the ground,’ in situations where the centralized knowledge either fails to or has no chance to describe a complex reality. The book classifies these two different kinds of knowledge as techne (general knowledge) and metis (local knowledge). In my reading, the techne – in both strengths and shortcomings – bears similarity to the knowledge we obtain from traditional algorithms, while metis knowledge is just starting to become available via statistical learning algorithms. In this (kinda long) post, I will outline some of the major points of Scott’s arguments, and look at how they relate to modern machine learning. In particular, the divides Scott observes between the knowledge of administrators and the knowledge of communities suggest an array of topics for research. Beyond simply looking at the difference between the ways that humans and machines process data, we observe areas where traditional, centralized data analysis has systematically failed. And from these failures, we glean suggestions of where we need to improve machine learning systems to be able to solve the underlying problems. I’ve been playing around with Cities: Skylines recently, the super-popular SimCity knock-off. Dealing with traffic is a core theme of the game (as it should be). Traffic tends to accumulate at intersections, and it’s well known that one-way streets have higher traffic flow. The logical conclusion, then, is to try to build a city with a single extremely long one-way street… Unfortunately we have to compromise on this perfect vision, because people want to get back home after work and so on. Meanwhile, a space-filling curve is an mathematical invention of the 19th century, and one of the earlier examples of a fractal. The basic idea is to define a path that passes through every point of a square, while also being continuous. This is accomplished by defining a sequence of increasingly twisty paths (H1, H2, H3, …) in such a way that H∞ is well-defined and continuous. Of course, we don’t want a infinitely twisty road, but the model of the space filling curve will still be useful to us. There are a few important ideas in the space filling curve. The first is a notion that by getting certain properties right in the sequence of curves H1, H2, H3, …, we’ll be able to carry those properties on to the limit curve H∞. The Moore curve is an example of a (continuous!) space-filling curve. The color changes keep track of time as you move along the path; notice that in the very twisty sixth path, a small change in time still keeps you in the same (blocky) neighborhood. The second main idea is how to get continuity. Thinking of the curve as a function where you’re at the start at time 0 , and you always get to the end at time 1, we want an H∞ where small changes in time produce small changes in position. The tricky part here is that the path itself gets longer and longer as we try to fill the square, potentially making continuity hard to satisfy… When the length of the path doubles, you’re moving twice as fast. In fact, because of continuity, you can also “go backwards:” Given a point in the square, you can approximate what time you would have passed through the point on the limit curve H∞, with arbitrary precision. This gives direct proof that the curve actually covers the whole square. Start in the lower-left corner. Go to the top of the square, and then move right by 1/k. Move to the bottom of the square, and move right by 1/k. Repeat steps 2 and 3 until you get to the right side of the square. The problem here is that a very small change in time might take us all the way from the top of the square to the bottom of the square. We need to be twistier to make sure that we don’t jump around in the square. The Moore curve, illustrated above, does his nicely: small changes in time (color) don’t move you from one side of the square to the other. 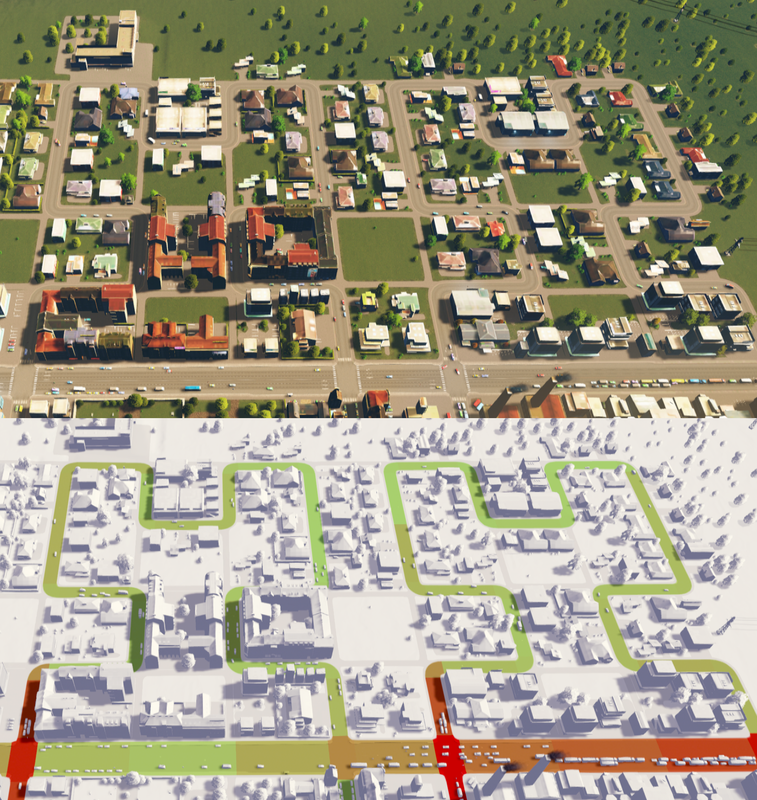 What happens if we try to use space filling curves to build a city in Cities: Skylines? My first attempt at building ‘Hilbertville’ was to make large blocks, with a single, winding one-way road for access, using the design of a (second-order) Hilbert Curve. 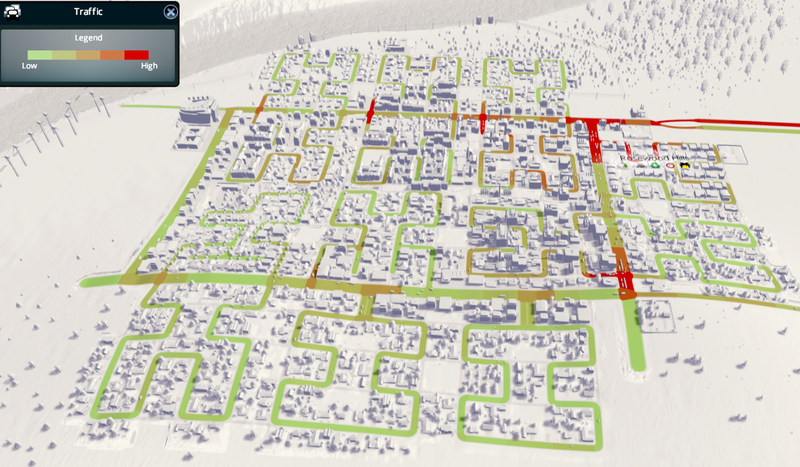 In addition to the roads, though, I placed a number of pedestrian walkways, which allow people on foot to get in and out of these neighborhoods directly. 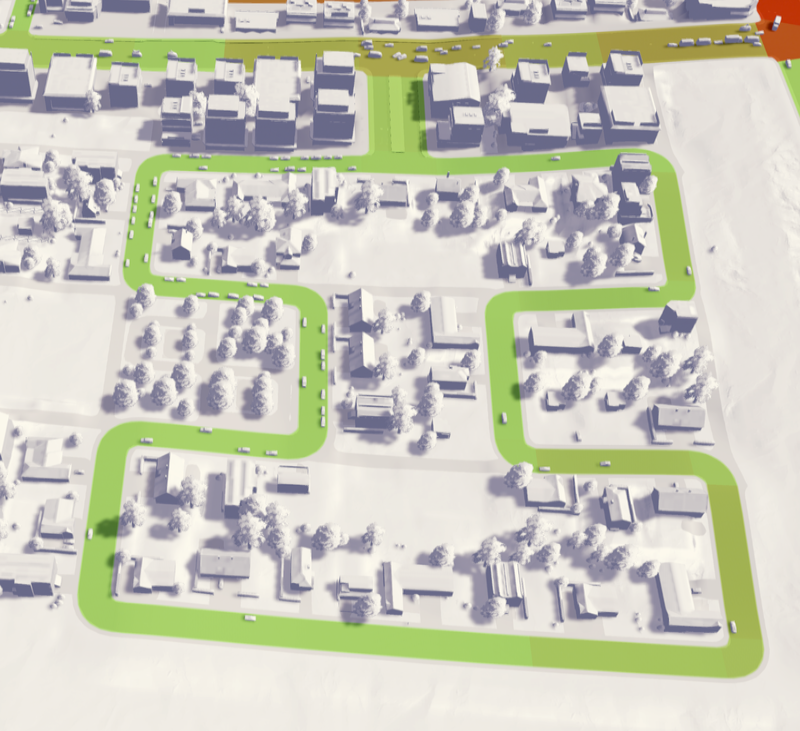 I like to think that this strongly encourages pedestrian transit, though it’s hard to tell what people’s actual overall commuting choices are from the in-game statistics. Hilbertville, two blocks. The lower view highlights where the roads are, and are color-coded for the amount of congestion along each segment of roadway. There’s a bit of congestion at the output of each block, as cars wait at the intersections. Skylines only allows building directly facing a road; corners tend to lead to empty space. You can see a large empty square in the middle of the two blocks pictured above. There are also two smaller rectangles and two small empty squares inside of each of these two blocks. Making the top ‘loop’ a little bit longer removed most of the internal empty space. This internal space is bad from the game perspective; ideally we would still be able to put a park in the empty spaces to allow people to extra space, but even parks require road access. A space-filling road based on the Moore curve. We still get the wasted square between neighborhoods, but somewhat reduce the amount of empty interior space. Potentially, we could develop a slightly different pattern and alternate between blocks to eliminate the lost space between blocks. Also, because the entrance and exit to the block coincide, we get to halve the number of intersections with the main road, which is a big win for traffic congestion. Here’s a view of the full city; it’s still not super big, with a population of about 25k. We still get pretty heavy congestion on the main ring road, though the congestion is much less bad than in some earlier cities I built. In particular, the industrial areas (with lots of truck traffic) do much better with these long and twisty one-way streets. Full view of Hilbertville, population 25k. There are fourteen blocks here; note the two Moore curve blocks at the bottom, and the slightly modified Hilbert curve block in the lower left, which reduces empty space at the expense of a slightly longer road. The empty space is actually caused by all of the turns in the road; fewer corners implies fewer wasted patches of land. The easiest way to deal with this is to just use a ‘back-and-forth’ one-way road, without all of the fancy twists. The other major issue with this style of road design is access to services. Fire trucks in particular have a long way to go to get to the end of a block; the ‘fire danger’ indicators seem to think this is a bad idea. I’m not sure if it’s actually a problem, though, as the amount of traffic within a block is next to none, allowing pretty quick emergency response in spite of the distance. Overall, I would say it’s a mixed success. There’s not a strong reason to favor the twisty space-filling curves over simpler back-and-forth one-way streets, and in either case the access for fire and trash trucks seems to be an issue. The twistiness of the space-filling curve is mainly used for getting the right amount of locality to ensure continuity in the limit curve; this doesn’t serve a clear purpose in the design of cities, though, and the many turns end up creating difficult-to-access corner spaces. On the bright side, though, traffic is reduced and pedestrian transit is strongly encouraged by the design of the city. 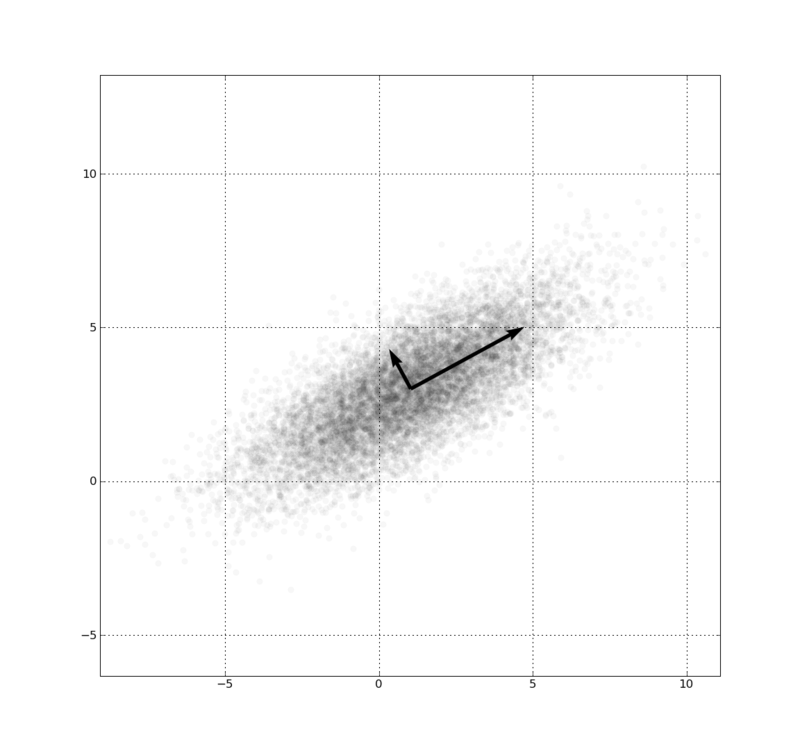 In the last two posts, we’ve looked at using machine learning for playing iterated Roshambo. Specifically, we saw how to use Bayes’ theorem to try to detect and exploit patterns, and then saw how Fourier transforms can give us a concrete measurement of the randomness (and non-randomness) in our opponent’s play. Today’s post is about how we can use representation theory to improve our chances of finding interesting patterns. 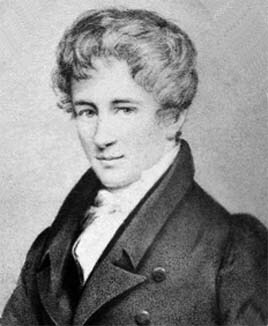 Niels Henrik Abel, for whom ‘Abelian groups’ are named. These are groups where for any x, y. In the last post, we looked at using an algorithm suggested by Bayes’ Theorem to learn patterns in an opponent’s play and exploit them. The game we’re playing is iterated rock-paper-scissors, with 1000 rounds of play per game. The opponent’s moves are a string of choices, ‘r’, ‘p’, or ‘s’, and if we can predict what they will play, we’ll be able to beat them. In trying to discover patterns automatically we’ll gain some general knowledge about detecting patterns in streams of characters, which has interesting applications ranging from biology (imagine ‘GATC’ instead of ‘rps’) to cryptography. Fourier analysis is helpful in a wide variety of domains, ranging from music to image encoding. A great example suggested by ‘Building Machine Learning Algorithms with Python‘ is classifying pieces of music by genre. If we’re given a wave-form of a piece of music, automatically detecting its genre is difficult. But applying the Fourier transform breaks the music up into its component frequencies, which turn out to be quite useful in determining whether a song is (say) classical or metal. Balázs Szendrői works with participants at the Mombasa algebraic geometry workshop. The workshop has participants attending from Kenya, Tanzania, Uganda, Rwanda, and Zambia. The participants have been super motivated; we’re just finishing up the third and final week of the workshop, and the participants have been staying up late working on final projects. Attendance has stayed high throughout the workshop, to a degree you wouldn’t expect in (say) North America. The chance for exposure to math going on at the international level is a big draw, since it’s still so rare for international mathematicians to come through East Africa. I imagine it’s like if you only got to eat ice cream once every year or three: you’re not going to let anything go to waste. Group shot from the Bahir Dar math camp. The waterfall in the background is one of the major sources of the Nile! I’ve spent this last week helping with the first-ever Ethiopian math camp, hosted by the math department at Bahir Dar university. As with the Maseno math camp, we focused on giving activity-based sessions, teaching interesting math topics outside of the standard curriculum. The intention is to boost student interest in maths and to expose some teachers to different ways of thinking about mathematics. The big difference between the Maseno and BDU camps is that the students in Ethiopia are mainly Amharic speakers, with maybe a couple years of learning English under their belt. This makes it essential to build up and utilize the local staff to a degree that we aren’t forced to in Maseno. Luckily, the local staff is bright, imaginative, and ready to try new things. On the whole, it was a fantastic first attempt. We gave thirty-ish sessions, divided into five topic areas: geometry, scientific research, card tricks, history of numbers, and ‘rules.’ I was a few days late arriving at the planning week, due to some medical exams I needed to get done in Addis, and so was mainly designing the card trick sessions. I also did a lot with the geometry group and gave a session each on cryptography and complex numbers.